1926 $2.50 Sesquicentennial Of American Independence Comm. 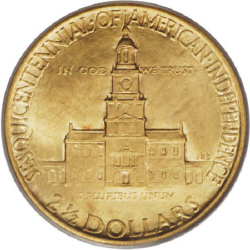 The 1926 $2.50 Sesquicentennial Of American Independence Gold Commemorative was designed by John R. Sinnock, and celebrated the 150th anniversary of American Independence Fair held in Philadelphia. The sale of the coins financed the fair. Re: 1926 $2.50 Sesquicentennial Of American Independence Comm. For a 1926 coin, it looks a little crude? 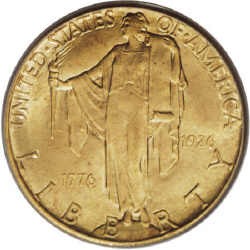 zakota wrote: For a 1926 coin, it looks a little crude? It's quite artistic really. Just using the style of the time. The picture isn't the best. I am not nocking the coin. It may have been ment to look like that. It is a nice coin. I am not into gold myself. I like the silver if I were to buy. I like the sheen and the coloration it gets with age. I agree. I like silver coins the best. It usually tones well and gives a look of antiquity better than gold.